Whenever this classic Chinese dish, Stir Fried Shredded Beef with Preserved Vegetableis put in front of me, I’d definitely eat more rice. You can’t image how tasty the sweet and sour preserved vegetable would be, that goes so well with the tender stir-fried beef. 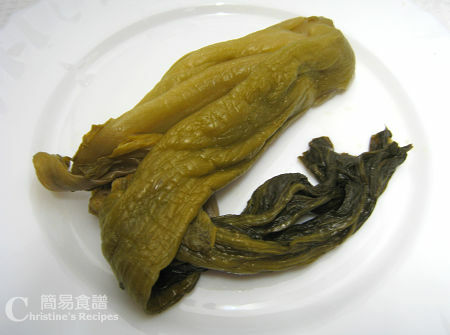 In Chinese cooking, there is a variety of preserved vegetables that can be used. For this dish, it has to use the one that is also known as pickled Chinese mustard (味菜 or 酸菜, Suan Cai), fermented by pickling with salt and brine. To prepare the suan cai, it only involves three steps: soaking in salted water, rinse with plenty of water and stir-frying with vinegar and sugar to adjust the taste to preference. I learned the trick from my mother-in-law, who is experienced in cooking suan cai. Add a teaspoon of salt in a bowl of water. Soak the preserved vegetable in salted water for half an hour. Wash with plenty of water and rinse well. Squeeze out excess water. Roughly cut into smaller pieces. Mix beef with marinade for about 20 minutes. Set aside. Heat 2 tablespoons of oil in a wok or frypan. Sauté beef over medium to high heat until 80% done. Don’t cook the beef through at this stage yet, because you will stir fry the beef with other ingredients and cook some more time. If the beef is overcooked, the texture would be too tough otherwise. Dry fry the preserved vegetable (no need to add any oil) in a stainless steel wok or pan over low heat. Add vinegar and sugar and stir all the way through. Taste and adjust the amount of vinegar and sugar until you are satisfied. 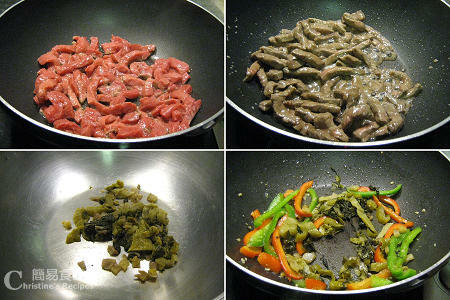 Use the same pan you stir fried the beef. Add more oil to sauté garlic over medium-high heat until aromatic. Add green and red capsicum. Pour 2 tablespoons of chicken stock and cook until dry up a bit. 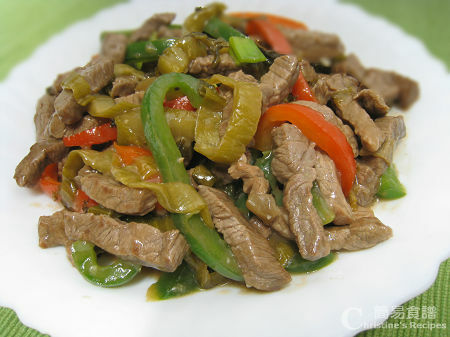 Toss in preserved vegetable and beef. Quickly stir fry and combine all ingredients well. Add thickening and cook to your preferred consistency. Serve hot. This is such a flavourful dish. Can wallop the whole dish. haha..... Btw, I've an award for you. Please feel free to drop by to collect the batch. Cheers. Mmmm.. the preserved vegetables will surely make it more appetising. Yum - this sounds full of flavor! A georgous & very tasty dish, Christine! Such a delicious looking stir-fry! Great flavors! I have a few Chinese cookbooks that use preserved vegetables - I never knew how to use them until I read this post - thanks Christine!! I've never cooked much with preserved vegetable, but have always been intrigued to give it a try. Now I have the perfect recipe to check out. thanks for sharing. Your marinade says 1 water. Can you specify? Thanks! Sorry, missed that measurement. It should be 1 teaspoon of water. Updated! Thanks so much for the recipe. I cooked it tonight to go with my porridge! So Yum! Can you please tell me why the preserved vegetable needs to be soaked in salted water and not just water? And what is the purpose of dry frying it? Thanks in advance. I followed my mother's method to prepare all store-bought preserved vegetable. By soaking it in salted water for a while, it helps to remove any impurities. The dry frying will help bring out its flavour and aroma.